Horses are herd animals so seek comfort and security in numbers. This filly lacks confidence so just for safety sake, she would benefit from a companion animal (llama or another horse) when out on pasture. To build her confidence, your friend could hold her training and riding sessions out in the pasture, building a strong bond with her out there. It sounds like she needs a thorough ground training review if she whirls or pushes when he tries to lead her. There are many articles on this blog (use the search tool in the right hand column) and my website horsekeeping.com related to behavior and ground training. Buddy Bound Horse – What Can I do? My 3 year old paint horse tries to take my 7 year old back to the other horses will I’m leading him and i do not want him to. what should i do. The behavior you describe can be thought of as Herd Bound, Buddy Bound or Barn Sour or a combination of all 3. Horses are herd animals and when left on their own, they gang together in twos, threes, bands and herds. That is natural horse behavior. But when a horse, in this case, the 7 year old you are leading, is being tempted to misbehave by another horse, your 3 year old. Generally it is because one or both horses are insecure and don’t want to be separated from each other. It could also be that they just want to play. But in any case, they need to learn a new set of acceptable behavior when you are leading. All horses need to develop confidence and good manners so that you can lead them in a variety of tempting and stressful situations. It is the horse you are leading that you should focus on, not the one that is trying to start up the mischief. 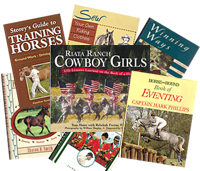 If you go to the horse article page on my website www.horsekeeping.com and look under the topic Behavior – you will see a number of articles on Barn Sour behavior which also cover Buddy Bound and Herd Bound. Reading those will give you some good ideas as to why this behavior occurs and how to prevent and fix it. Horses are some of the kindest, most generous and trainable animal partners you can find. That’s why when a horse does something “bad”, it’s usually due to poor management or training. In order to deal with vices and bad habits, we need to understand what causes them. THEN we can design our horse care and training to PREVENT them. A bad habit is an undesirable behavior that occurs during training or handling and is usually a result of poor techniques and a lack of understanding of horse behavior. Examples are rearing, halter pulling, striking and kicking. Balking Refusal to go forward often followed by violent temper if rider insists. Fear, heavy hands, stubbornness, extreme fatigue. Curable. Review forward work with in-hand & longeing. Turn horse’s head to untrack left or right. Strong driving aids with no conflicting restraining aids (no pull on bit). Do not try to force horse forward by pulling – you’ll lose. Herd Bound Balking, rearing, swinging around, screaming and then rushing back to the barn or herd. Separation from buddies or barn (food, comfort). Curable but stubborn cases require professional. A confident, capable trainer that insists the horse leave the barn (herd) and then positively reinforces the horse’s good behavior so horse develops confidence. The lessons GO and WHOA must both be reviewed. Biting Nibbling with lips or grabbing with teeth especially young horses. Greed (treats), playfulness (curiosity) or resentment (irritated or sore). Investigate things with mouth. Often from hand-feeding treats. Curable. Handle lips, muzzle, & nostrils regularly in a business-like way; when horse nips, tug on nose chain, then resume as if nothing happened. Can also use thumb tack on sleeve; hold wire brush toward lips; use muzzle. Bolting When Turned Loose Wheels away suddenly before halter is fully removed. Poor handling, anxious to exercise or join other horses. Curable but dangerous as horse often kicks as he wheels away. Use treats on ground before you remove halter; use rope around the neck. Bucking Arching the back, lowering the head, kicking with hind or leaping. High spirits, get rid of rider or tack, sensitive or sore back, reaction to legs or spurs. Monitor feed and exercise; proper progressive training; check tack fit. Can’t Catch Avoids humans with halter and lead. Fear, resentment, disrespect, bad habit. Curable. Take time to properly train, use walk-down method in small area first, progress to larger. Remove other horses from pasture; treats on ground, never punish horse once caught. Can’t Handle Feet Swaying, leaning, rearing, jerking foot away, kicking, striking. Insufficient or improper training. Horse hasn’t learned to cooperate, balance on 3 legs, take pressure and movement of farrier work. Curable but persistent cases require professional. Thorough, systematic conditioning and restraint lessons: pick up foot, hold in both flexed & extended positions for several minutes while cleaning, grooming, rubbing leg, coronary band, bulbs etc. Halter Pulling Rearing or setting back when tied, often until something breaks or horse falls and/or hangs by halter. Rushed, poor halter training, using weak equipment or unsafe facilities so horse gets free by breaking something. Often horse was tied by bridle reins and broke free. Can be curable but very dangerous and incurable in some chronic cases which require professional. Might use stiff bristled broom on the rump or wither rope on advice of professional. Head Shy Moves head away during grooming, bridling, clipping, vet work. Initially rough handling or insufficient conditioning, painful ears or mouth problems. Curable. First eliminate medical reasons such as ear, tongue, lip or dental problems. Start from square one with handling; after horse allows touching, then teach him to put head down. Jigging Short, stilted walk/jog with hollow back and high head. Poor training attempt at collection, horse not trained to aids, too strong bridle aids, sore back. Curable. Check tack fit, use aids properly including use of pressure/release (half halt) to bring horse to walk or use strong driving aids to push horse into active trot. Kicking Lashing back at a person with one or both hind legs, also “cow kicking” which is lashing out to the side. Initially reflex to touching legs, then fear (defense) of rough handling or to get rid of a threat or unwanted nuisance. Might be curable but serious cases are very dangerous and require professional to use remedial restraint methods. Unlikely to ever completely cure. Rearing Standing on hind legs when led or ridden, sometimes falling over backwards. Fear, rough handling, doesn’t think he must go forward or is afraid to go forward into contact with bit; associated with balking; a response to collected work. Can be curable but is a very dangerous habit that might be impossible to cure even by professional. Check to be sure no mouth or back problems. Review going forward in-hand with a whip and review longeing. Bolting Galloping out of control. Fear, panic, (flight response), lack of training to the aids, overfeeding, under exercise, pain from poor fitting tack. Might be curable but very dangerous as when horse panics, can run into traffic, over cliff, through fence, etc. ; remedy is to pull (with pressure and release) the horse into a large circle, gradually decreasing the size. Shying Spooking at real or imagined sights, sounds, smells, or occurrences. Fear (of object or of trainer’s reaction to horse’s behavior), poor vision, head being forcibly held so horse can’t see, playful habit. Generally curable. Striking Taking a swipe at a person with a front leg. Reaction to clipping, first use of chain or twitch, restraint of head, dental work. Curable but very dangerous especially if coupled with rearing as person’s head could be struck. Review head handling (mouth, nostrils, ears); head down lesson; and thorough body handling and sacking out. Stumbling Losing balance or catching the toe on the ground and missing a beat or falling. Weakness, lack of coordination, lack of condition, young, lazy, long toe/low heel, delayed breakover of hooves, horse ridden on forehand, poor footing. Curable. Have hoof balance assessed, check breakover, ride horse with more weight on the hindquarters (collect), conditioning horse properly. Tail Wringing Switching and/or rotating tail in an irritated or angry fashion. Sore back from poor fitting tack, poorly balanced rider, injury, rushed training. May not be curable once established. Proper saddle fit, rider lessons, massage and other medical therapy, proper warm-up & progressive, achievable training demands. Most horses are good. However, any horse can become a bad actor with improper care or handling. Certain horses have a predisposition to neurotic breakdown when faced with domestication pressures. This psychological frailty may be genetically inherited, formed from early experiences with the dam or training, or may develop later in life due to disease or trauma. Horses with neurotic tendencies often form vices. Vices are undesirable habits that horses exhibit in the stable environment and are generally caused by confinement, over feeding, and stress. Examples are cribbing, stall kicking, and weaving. Bad habits, such as rearing, halter pulling, or tail wringing are undesirable behaviors in response to human handling and are generally caused by rushed or improper training, uncertainty, insecurity, or resentment. A resentful horse is uncooperative and resistant. His resistance can be based on confusion, fear, disrespect, fatigue, and occasionally high spirits. Often a horse’s action is interpreted by humans as misbehavior but is perfectly legitimate horse conduct. Of course, what is acceptable behavior between two horses is not between a horse and a human. Here’s where practical horse psychology, behavior modification, training, attitude adjustment, conditioning, whatever you want to call it, is essential. Most vices and bad habits are preventable, that is, with forethought and proper management and training, most of them can be avoided. Prevention is the desirable route because once certain habits are established, they can be extremely difficult to change. Some habits are manageable, that is, certain techniques and equipment can be used to diminish the negative effects of the habit, but the underlying habit is still there. If the equipment is not used, the habit resurfaces. A few habits are curable. With carefully planned, diligent efforts, some habits can be permanently changed. Some vices and bad habits are incurable. 7. Consider medical and surgical solutions. UNDERSTANDING HORSE BEHAVIOR AND NEEDS A horse’s natural behavior must be altered somewhat so that the horse can adapt to domestication. Basing these modifications on natural behaviors results in minimal stress and long-lasting results. Whether or not there is action, there is always behavior. A sullen horse, rigid and unyielding, is “behaving” just as is the wildly bucking one. Behavior that is repeated may become habit (even though it was not a human-designed lesson). Horses are constantly learning as a result of their casual handling and their everyday environment as well as from formal training sessions. The horse is a gregarious nomad with keen senses and instincts and highly developed reflexes. These characteristics are responsible for sending a reining horse to the winners circle as well as sending a panic-stricken horse through a wire fence. Gregarious animals are sociable herd animals. Given the choice, horses are rarely seen alone, preferring to be in close proximity to other horses; there is safety and comfort in numbers. Horses perform daily routines in response to various needs: eating, drinking, rolling, playing, participating in mutual grooming. The desire to perform these rituals is not diminished, and in fact is probably intensified, for the horse in confinement. Humans might think a horse prefers to be clean, clipped and blanketed but most horses will opt for a good roll in the mud. The old adage, “You can lead a horse to water, but you can’t make him drink” is based on firmly implanted habits which are governed by a biological-clock. Many behaviors are socially oriented (and contagious): eating, pawing and rolling, running and bucking, wood chewing, cribbing. Just because horses want to be with other horses doesn’t mean all horses get along. Battles are fought to determine the pecking order or dominance hierarchy. This establishment of social rank usually makes future aggression unnecessary. Humans occupy a rung on the ladder of power and are tested by horses to see where they stand. A horse handler must convince a horse that the human is on top. Sometimes horses try to interact with humans as if they were horses. While a young horse is being groomed, he often wants to reciprocate as he would to his mutual grooming buddy in the pasture. Even though such a gesture is meant to be friendly, not aggressive, intentions don’t count. The act of nibbling must be discouraged with a clap on the horses neck or shoulder along with a firm “No”. Then get the horse busy doing something else. If a horse has not been sufficiently socialized away from other horses and with humans, the horse will be insecure and often will desperately attempt to retain communication with or proximity to herd-mates or the barn. The chronic case is called herd bound or barn sour because the insecure horse links comfort, companionship, and food with the barn. What may originate in a young horse as a temporary insecurity may evolve into a long-standing and dangerous habit. In order to ensure that such a bad habit does not get started, handle horses separately from a very early age. Look for upcoming posts on specific vices and bad habits.